The backbone of a concealed-carry system, don’t waste time on anything other than quality gun belts. Gun belts don’t get the respect they deserve. All the glory goes to that top-notch pistol you spent weeks if not months poring over, nailing down every pertinent particular. It goes to the ultra-concealable, not to mention comfortable, holster that took forever to find and now feels like a second thought. It even goes to the defensive ammo you researched and test shot and compared against a litany of other viable options. When it comes to a belt, typically, there isn’t any enthusiasm left. Any old one will do, right? Maybe, you can save a buck, passing off your everyday dress one for a while. If this sounds comparable to your experience, don’t feel alone. Perhaps no other concealed-carry accessory is more overlooked by newly minted armed citizens. Yet, perhaps no other single piece of gear plays a more important role in ensuring a successful concealed-carry system. Get it right and a gun belt enhances every aspect of carrying a defensive handgun. Choose wrong or ignore it all together and it will leave you dragging. Feel the middle of your back. Unless you’re a jellyfish or sea slug, you ran your fingers over that familiar vertical stack of 33 bones known as your spinal column. It’s the support system that makes walking, running, sitting, lifting objects and nearly any other activity consider human — or mammalian for that matter — possible. Pretty important, to say the least. A quality gun belt plays a similar role. It’s fair to consider it the backbone of your carry system. All other aspects of how you carry and how well you do it branch off this simple strap around your waist, so you’d better know what your getting when you go to buy. Additionally, a gun belt should be comfortable, because you’ll curse the day you bought it if it isn’t. And it won’t hurt if it looks good. A minor point, but stylish gun belt options abound today, so might as well take advantage of them. Hang a gun off your dress belt and almost immediately you’ll see a couple things happen. Right off the bat, it will likely twist, jutting the gun’s grip away from your body. And it will probably transfer a great amount of the pistol’s weight to your britches, inevitably making them slouch like a high school freshman. Neither is ideal, making concealment difficult and a clean draw more like a comedy routine. The simple reason why this is, the belt was designed to hold the weight of your pants, little else. Gun belts are devised for much greater loads, 20-ounces-plus of holster, pistol and perhaps extra magazines. And there’s little secret to how it accomplishes this feat —better material, more of it and, in many cases, reinforcement. Top-notch gun belts are made from double-thick leather, stiff as an oak stave and, in heavy-duty models, wrapped around a solid core. In many cases, the core is Kydex, a strong yet flexible type of plastic, favored in holster making. But in the top-of-the-line variety, the reinforcing material is spring steel. The combination of this material, when properly constructed, a belt is malleable enough to comfortably serpentine around the waist, yet yields little to vertical pressure. Leather is by far the most common material available and options abound, including excellent examples from Bigfoot Gun Belts and Alien Gear. On the plus side, they’re extremely durable and typically sharp looking. But, over time some show surface wear where the belt contacts the holster loops. Like leather gun belts, the synthetic variety get the majority of their strength from extra material. Thick nylon webbing provides support, but they are also available in reinforced models with a steel or synthetic cores to increase stiffness. Though tactical in appearance, thus perhaps not the three-piece-suit armed citizen’s cup of tea, synthetic gun belts tend to offer more comfort and flexibility. Not limited by pre-punched holes in most cases, the belts easily adjust to fit perfectly every time. Older models did have some wear issues, fraying at the tip after time. In recent years, companies have addressed the issue through the use of epoxies, such as with Galeco’s Instructor’s Belt, which virtually eliminates this unsightly erosion. Aside from a gun belt’s functionality and comfort, holster compatibility is of significant importance. If the two don’t play nice, well then you’re not going to get the most out of your system. In general, gun belts come in 1 ¼- to 1 ¾-inch width, so check your loop size before you buy. Size is also an extremely important consideration and sometimes a frustrating number to come up with, simply because how makers measure. Some start at the loop at which the buckle attaches, others at the end of the buckle. You should plan on legwork to eliminate guessing. Get on the gun belt makers’ websites or give them a call and find out how they want you to measure your size and proceed accordingly. They want to get it right as much as you do, so take advantage of their expertise. Concealed carry is greater than simply the gun, like good marksmanship is more than just front-sight focus, grip or trigger pull. It’s a system — from mindset to training to gear. And, inevitably, it’s only as strong as its weakest link. Given the wealth of options and superior modern construction, there’s no excuse to allow something as simple and vital as a gun belt to turn into the faulty linkage. 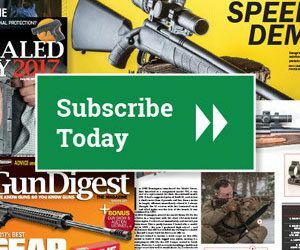 ❰Video: Should You Keep Your Defensive AR Loaded?